Are you looking for the best image slider plugin for your WordPress site? Do you want to know what you should look for to create the fastest and most professional-looking image slider? In this guide, we will share the ten reasons to choose Soliloquy as your WordPress slider plugin. What do you need in an image slider? Most site owners or photographers look for an image slider that is simple, cost effective, efficient, and full of features. One of the most important qualities that differentiates Soliloquy from other image sliders is its simplicity and lightening fast speed. Soliloquy image slider is designed to meet quality web standards and help you to rank higher in search results. 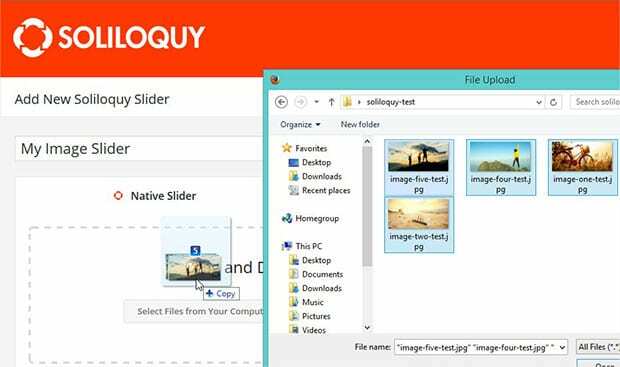 Soliloquy allows you to drag and drop your slides in the image slider. You simply need to create an image slider in WordPress and add the slides. It saves a lot of time as you can add multiple slides in one drop. You can also move the images by drag & drop to change the order of slides. When it comes to managing your WordPress image slider, Soliloquy has a simple and easy admin backend. Its settings are similar to the default WordPress dashboard which makes it easier to understand and display your image sliders. To learn more about image slider practices, you should also check out our tutorials for Soliloquy image sliders. You may have heard that image sliders are not good for SEO. However, Soliloquy is built to overcome this myth for WordPress image sliders. Each slide has its own title and alt text, caption, link, and more. Images are preloaded, so the outcome is fast and the speed helps in the search engine rankings of your site. All the image sliders you create with Soliloquy are fully responsive and work amazingly on all the mobile and tablet devices. You don’t need to write any code to make your WordPress sliders responsive. Soliloquy sliders automatically match to your screen size or resolution for the best result. Carousel – Turn any WordPress slider into a responsive carousel. Lightbox – Easily create a lightbox slider with your photos, videos, and galleries. Thumbnails – Add thumbnail images as navigation for your sliders. Instagram – Import your images from Instagram into your slider. You can see the full list of Soliloquy features here. Want to customize your WordPress image slider? Soliloquy allows you to add custom CSS in the image slider. You can customize each slider individually. You should check out this guide on how to add custom CSS to your WordPress image slider to learn more. There’s no limit in creating sliders with Soliloquy. Even with the basic personal license, you can add as many sliders as you need on your site. These sliders can be added to your WordPress pages, posts, and template files. Not many image sliders give customer support. With Soliloquy, you get premium support to solve your image slider issues in no time. A team of technical professionals and developers will be there for your image slider queries. You can create support tickets, and they will be responded to swiftly with the solution to your problem. 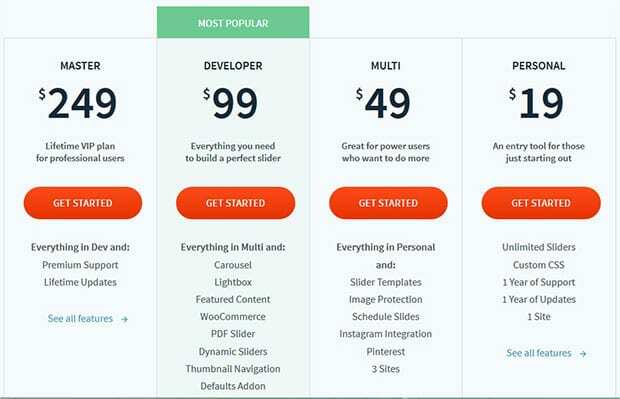 Of course, the best slider plugin in the world won’t help you if it’s unaffordable. That’s why Soliloquy slider plugin offers 4 different packages for beginners to master level. You can start with the personal license, and then upgrade your account anytime to get more features for your image slider. We hope this guide has helped you to learn the ten reasons to choose Soliloquy as your WordPress slider plugin. You may also want to check out our guide on how to add a homepage slider in WordPress and 19 tips to speed up WordPress performance. If you like this guide, then please follow us on Facebook and Twitter for more free WordPress tutorials & resources. Thanks for your nice article on “10 Reasons to Choose Soliloquy as Your WordPress Slider Plugin”. Yes, I do agree with you and hope users will get benefit from your awesome description about Soliloquy plugin. Glad you like this guide. Please share it with others. 🙂 And do follow us on Facebook and Twitter for more free tips and resources. I’m not positive where you are getting your info, however great topic.I must spend some time learning much more or working out more.Thanks for wonderful info I used to be in search of this information for my mission. Your listed plugin is really good and useful. Thank you for sharing us.